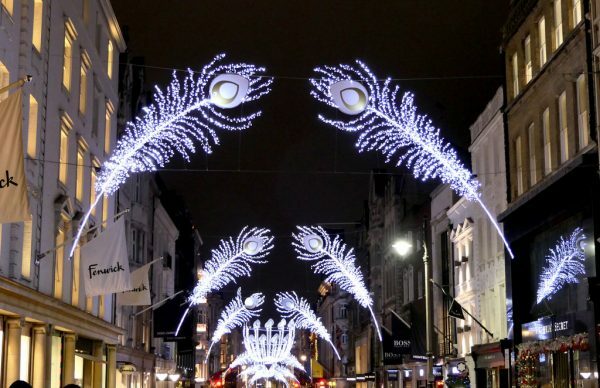 If you are into Christmas and you love nothing more than getting into the festive spirit, what better way to do so than to wander around London, taking in all of Christmas lighting on show. From tasteful to tacky, take a look at the following list for the best lights on show in the capital this December. Definitely at the tacky end of the Christmas light spectrum, but beautifully and charmingly tacky it is. Each year brings a different theme and this year’s is ‘Bohemian Rhapsody’. In honour of Queen and the release of the film released this year, the street is filled overhead with bright lyrics from the famous song. Line by line of Bohemian Rhapsody, sing your way down the street as you stroll under the colourful lights. Slightly more high-end and and tasteful, Regent’s Street has a slightly more mesmerising feel. You will see bright white angel after bright white angel and their sheer size and juxtaposition against the night sky will captivate you. London’s famous gardens are beautiful enough during the day, but to see them lit up at night is like walking into a neon wonderland. This is still a new experience in London so if you are interested in beautiful gardens combined with Christmas lights, book as soon as possible. This wonderful square and market in the heart of London needs no introduction as already one of the most beautiful places to visit. But, during December, Covent Garden is simply magical. Not only are there numerous Christmas lights, but there is also the famous Christmas tree. All this and the street performances make for a great evening. Looking for a new year’s resolution and want a new challenge? Why not do a Celta in London? Click to find out more about our course at EC.